"I named my Sony Nex 5n, Cari." I never really owned a camera. I used to borrow my sister's and when my mother bought a new one, I asked her if I could use the older one. But the more I got into nail painting, the more I became conscious of publishing quality photos of my nail art designs here in my blog. And so, about 2 years ago, I bought my very first camera. It was a Panasonic Lumix LX3 and I named her Lara. She has become a constant companion until recently when I received some projects that required me to submit photos with specifications that Lara could not give me. After careful deliberation, I decided to get a Sony Nex 5n and I named her, Cari. Can you spot the Sony Alpha logos which I hand painted on 2 accent nails below? The logos are on my left ring finger and on my right index finger. I didn't want to leave my other nails plain so I painted random swirls to complement the logo. Base color is A England Bridal Veil in 2 coats, that I absolutely adore. This is now my favorite black shade. Application is superb and I love the subtle hints of colors on close up. I love my Lumix LX3 and when I finally decided to get a better cam, I wanted to get a DSLR (digital single lens reflex) and I also wanted a compact one. Problem was, with my petite frame and well, small hands too, I doubted my capability to handle a DSLR cam as it was heavy and bulky at the same time. So I looked into other options and almost decided to get a newer model from Panasonic since I was already familiar with the brand and I really did love the performance of my LX3. So what made me switch to Sony? Well, a had the chance to meet an old friend last December 2011 and during our meet, I asked about that very interesting camera that he was carrying. It was a Sony Nex. My apologies, I was not able to get the model. But he gave me a quick demo of what the camera can do and I was struck. I researched for reviews the moment I got home and I finally decided that it was the best choice for what I was looking for ... and more. I am not going to pretend that I know a lot about the cameras because I really don't. So I am not going to get into a lot of technical details of the Sony Nex 5n. But I'd like to share with you why I, who knows little about cameras, fell in love with it. The Nex 5n comes from the line of mirrorless cameras from Sony Alpha, a DSLT (digital single lens translucent). The main difference between a DSLR and a DSLT is how light travels through the lens to the sensor. The latter has the advantage. You may read more about this here. 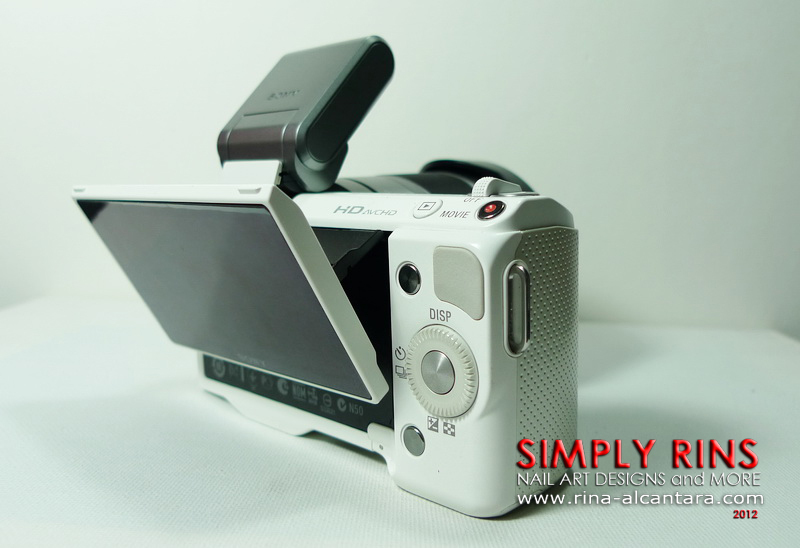 It is an interchangeable lens camera that performs really well with low light and can record full HD videos. It also boasts about its 3.0-inch tiltable Live View touch screen LCD. The performance of an DSLR minus the weight and bulkiness. It's no secret among family and friends that I wanted a DSLR camera because I recently became fascinated with photography. But mainly because I wanted quality photos for my blog and when I get to travel. Owning a DSLR for a nail art blog seems too much so I dismissed buying one and looked for other options that could give me the same photo quality. The Sony Nex 5n gave me just that and more. It was compact and was at least half the weight of a DSLR. It was perfect for my frame and my tiny hands. It's about portability, performance, and quality rolled into one camera. Camera strap from Punch Drunk Panda. Perhaps this should be included in my first reason but I figured this needed its own bullet point. I travel with friends that are photography hobbyist and there are times that I get to handle their DSLR cameras. Unfortunately, my petite hands, as probably most girls have (? ), get easily strained when holding a DSLR cam. I don't have that problem with Cari. Body is designed for comfort grip ... well, for us girls more particularly. Most of the time, I believe Sony released the NEX for women. I did say that I don't want to get into technical details of this camera. I still won't. But I do want to point out that the interchangeable lens feature is one of the reasons I fell in love with the Sony Nex 5n. It is compact and yet it offers the opportunity to step up my photography skills if I want to. As of this posting, I only have the kit lens (18-55mm) and I'm planning of getting a few more. This baby makes me want to be better in photography and I am definitely not complaining. My friends advised me to familiarize myself first with Cari's functionality before I acquire additional accessories for her. Sounds logical and practical, so that is what I'm doing. One objective of this nail art blog is to provide inspiration to nail artists or nail art enthusiasts through video nail art tutorials. I have done a few tutorials using the Sony Nex 5n. Although I have noticed some differences as compared to using the Lumix LX3, I know that I still have to discover the full potential of the 5n in terms of movie recording. View a sample of a nail art tutorial I prepared using the Sony Nex 5n here. I'm the type of person that would like to take a camera with me almost always. Carrying a DSLR most often than not attract attention. With the Sony Nex 5n, this is minimized and I love it for that. Makes me look like a professional. 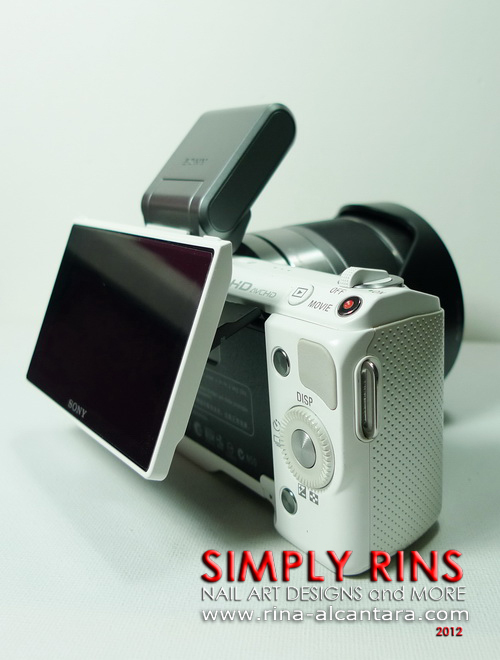 Various picture effects are available in the Sony Nex 5n that can easily make any photo look like it was taken by a pro. For someone like myself that is not so adept with the technicalities of photography, having such feature is definitely a plus. To name a few picture effects are High Contrast Monochrome, Retro, Toy Camera, and Partial Color. Oh yes, the 5n also boasts of a tiltable touch screen LCD! Navigate the menus and browse the gallery as if it was a smartphone. It is also equipped with an object tracking AF via touch. What this means is that you can lock the focus to a specific object using the touch screen feature. This also makes manual focusing a breeze! It has been a month since I had Cari and I am enjoying her company a lot. 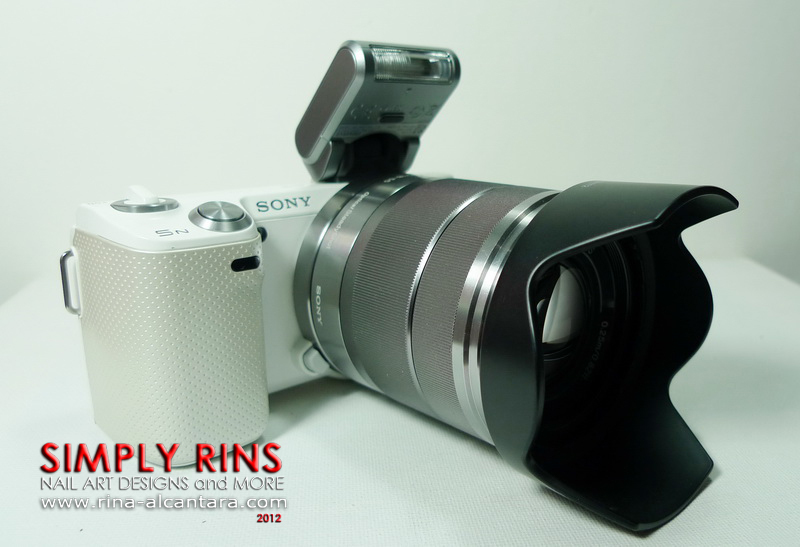 If you are interested to read the full specifications and features of a Sony Nex 5n, you may do so here. One downside of the Sony Nex 5n is the battery life. With the touch screen enabled at all times, the battery cannot last me the entire day with moderate usage. It is quite disappointing because it is one of the features that I truly find helpful. Even if the touch screen is disabled, the battery cannot last me a day with moderate to frequent usage. I have no choice but to buy an extra one if I want to take the 5n on travel adventures. Most common menus that I am accustomed to are buried into menus in the Sony Nex 5n. The common dial for changing from various shooting modes is absent. It is a disappointment because it consequently takes time to change settings between shots. ... is of course a photo of the Sony Alpha nail art that I took using the Sony Nex 5n. First and foremost, thanks to my nanay (english: mother) who made my wish of owning a Sony Nex come true. An unfortunate event happened that made me lost the money I saved for this baby. I am truly thankful to her because regardless of the incident, I am now enjoying the company of Cari, which I actually named after nanay whose name is Carina. To Reg and Mitzi, who introduced me to the Sony Nex. For without whom, I would not have been enticed to know about. All creative shots were taken by Roz Rojas Racca, a fellow Sony user. From the time I got Cari, I already wanted to create a blog post about her. The problem was I knew I would be having a hard time taking photos of myself with the camera. So I asked the help for Roz, a long time friend who I recently found out was into photography. Luckily, he had some free time one weekend to indulge my request. You may contact him at 09159378805 if you would like to hire his expertise. To Roz, thank you for bearing with me one Sunday afternoon. Your patience for my lack of projection and stiff body is very much appreciated. Haha! Make-up by Raquel De Jesus Oliva. I am not a girl that's into make-up, simply because I really don't have good skin. My skin is also highly sensitive. The most that I'd wear on my face on a regular day is powder, blush, and lipstick. And so I'd also like to extend my gratitude to Raquel for creating my casual look for the photoshoot. I could never have done that by myself. You may contact her at 09335222355. Wow, your camera looks amazing. I don't know much about photography, but I like your post. I learned a lot about cameras and yours. I'm so happy for you and Cari! Your friends did a great job too. You are a delight...thank you. Microsoft Exchange Server is a great and solid programming to offer successful informing condition. Be that as it may, in a few circumstances, the database backup Exchange Server Database (EDB File) may go over physical debasement and genuine information misfortune circumstances happen.